Bibimbap is one of the most well-known Korean dishes out there (maybe second after kimchi? If I had to guess). And it’s well known for good reason. What’s not to like about a piping hot stone bowl of rice, beef, veggies, egg, and spicy sauce, stirred together until the rice is toasty and crisp and the now-eggy-sauce coats everything? Also, it’s fun to say. At least for me. Bibimbap fits especially well into today’s “bowl food” craze, which seems to be giving cooks new licenses to mix up the traditional recipe with some of their favorite salad-y toppings. Sweet corn and cherry tomatoes? Grilled asparagus and snap peas? Why not? My own take on bibimbap was inspired by the book Bowl: Vegetarian Recipes for Ramen, Pho, Bibimbap, Dumplings and Other One-Dish Meals. There are some clever seasonal twists on ramen, pho, and bibimbap in that book, which got me thinking about how I might customize my own autumn bibimbap bowl. 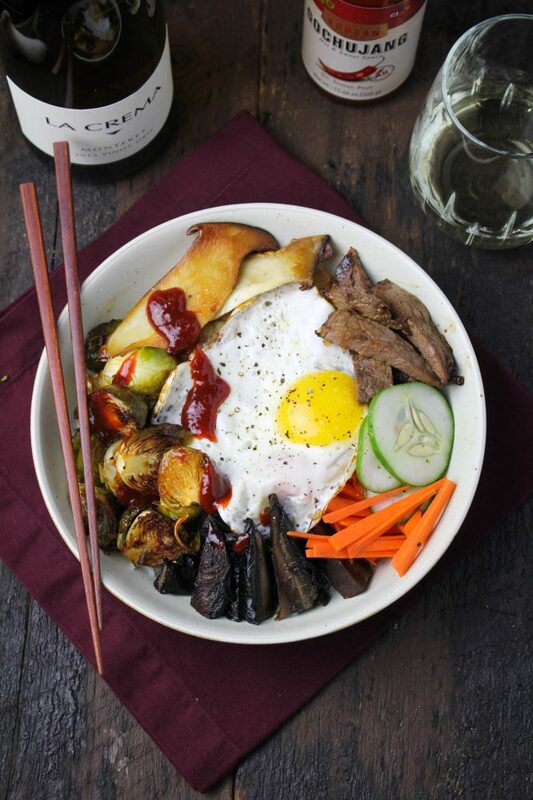 I landed on gochujang-roasted Brussels sprouts and tamari-roasted Portobello mushrooms as the seasonal additions to the more traditional marinated beef and fried egg. This made a delicious autumn dinner, especially served with a glass of La Crema Monterey Pinot Gris. 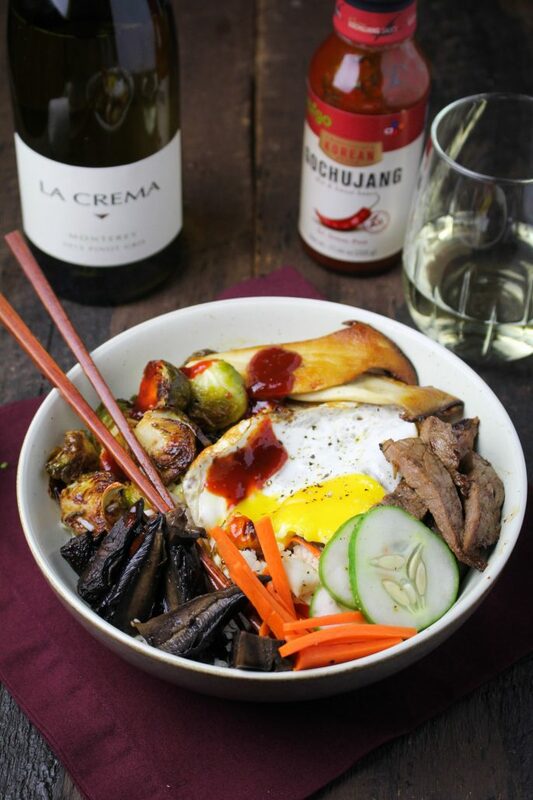 The bright minerality of the wine is an excellent counterpoint to the spicy gochujang and rich egg in the bibimbap. Since each individual component takes a bit of prep work, feel free to customize this recipe to leave out anything you don’t like or don’t have the time to make. Except the rice…you can’t really leave out the rice. Traditionally, bibimbap is served in a stone bowl that has been heated to a high temperature in an oven. Then cooked rice, toppings and a raw egg are added to the bowl and quickly stirred, cooking the egg and crisping the rice on the hot bowl. You can buy bibimbap bowls on Amazon or at a local Asian market, but if you want to make this in a regular bowl (I did!) you can mimic the effect by toasting your cooked rice in a little bit of oil in a frying pan. Alternatively, just serve everything as is – it’s still really delicious. 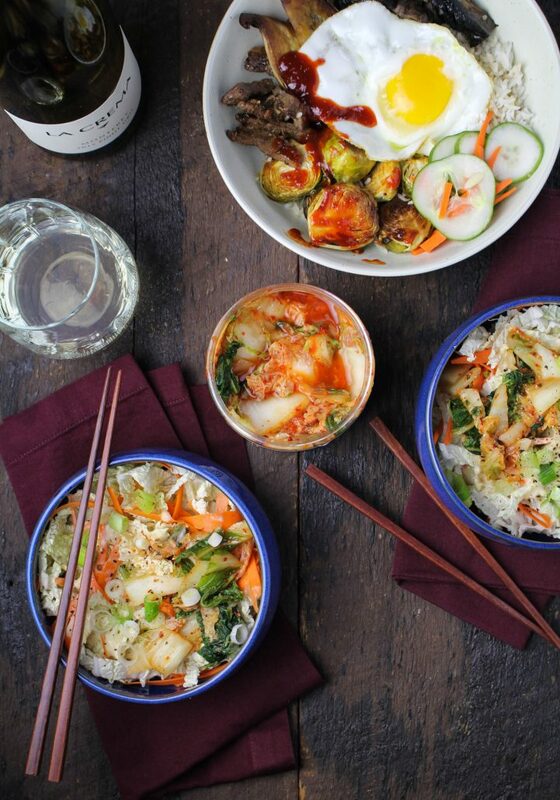 Bibimbap inspired by Bowl: Vegetarian Recipes for Ramen, Pho, Bibimbap, Dumplings and Other One-Dish Meals. Portobellos adapted from The Sprouted Kitchen Bowl + Spoon. To prepare the beef marinade, place shallot and pear in a large heavy duty Ziploc bag. In a small bowl, whisk together soy sauce, rice wine vinegar, honey, sesame oil, and gochujang until smooth, then add to the bag. Add the steak to the bag and zip tight. Rub the marinade over the steak to make sure it’s coated. Refrigerate for at least 8 and up to 48 hours. When ready to serve, preheat the oven to 400° In a small bowl, mix together the olive oil, the gochujang, and ¾ tsp sea salt. Place the brussels sprouts halves on a large baking sheet and pour the sauce over them, stirring to coat all the sprouts. Roast for 20-25 minutes, until brussels sprouts are tender, flipping once halfway through cooking. Remove and set aside. In a small bowl, mix together the sesame oil, honey, and soy sauce. Line a small baking sheet with tinfoil and place the Portobello caps on it. Pour the sesame-soy mixture on top of the portobellos, coating both sides of each mushroom. Place in the oven and roast until soft and collapsing, about 15 minutes. Remove from the oven and slice portobellos thinly. Place the prepared carrots and cucumbers in a medium bowl. Add the sugar, rice vinegar, and the remaining ¾ tsp salt to the bowl and stir together. Let sit for 10-20 minutes to lightly pickle the vegetables. To cook the beef, preheat a frying pan over medium heat with a small amount of canola or olive oil. Add the marinated beef and cook until just seared, about 60-90 seconds per side. Remove to a cutting board and thinly slice. To serve, divide the rice between four bowls. Top each bowl with the roasted brussels sprouts, slices of roasted portobellos, pickled carrots and cucumbers, sliced beef, and a fried egg. Serve with gochujang on the side. Juicy. Fresh. Enticing. Coastal wind and fog are no match for this bright, fruit-filled Pinot Gris. Katie Morris is the blogger and photographer behind Katie at the Kitchen Door, a food blog that showcases creative twists on everyday recipes. Based in Boston, she's a New Englander through and through, but her frequent travels have taken her as far afield as Russia, Ecuador, and Hong Kong, and each new destination inspires more delicious food. When she's not in the kitchen or on a plane, Katie enjoys running, ballet, and making overly ambitious attempts at vegetable gardening with her boyfriend.